November 2, 2009 - The Fair Treatment for Experienced Pilots Act (the act) extended the federal age standard for pilots of large commercial aircraft from 60 (Age 60 Rule) to 65 years of age. The act also required Government Accountability Office (GAO) to report--no later than 24 months after its enactment--on the effect, if any, of this change on aviation safety. This report responds to that requirement. Early Indications show that increasing the Age Limit for Commercial Airline Pilots has no effect on aviation safety. FAA’s and NTSB’s accident and incident data showed no adverse safety effects attributable to the increase in the age limit for pilots. At the Government Accountability Office (GAO) request, both agencies reviewed their respective databases for the period from December 2007 through September 2009 and found that no accidents or incidents during that period resulted from the health conditions of pilots 60 years or older. FAA’s Accident and Incident Data System (AIDS) captured seven incidents involving captains aged 60 and 61, but no health or cognitive issues of any kind were reported for these incidents. GAO review of FAA's accident and incident data and NTSB's accident data from December 2007, when the act was enacted, through September 2009 showed that no accidents or incidents resulted from the health conditions of pilots 60 years or older. However, for a more definitive assessment, a longer period of time would be required to collect data for similar groups--both pilots 60 years or older and younger pilots-- to determine if the act's change in the age standard for commercial pilots has any effect on aviation safety. Such a study is not yet feasible because the act is too recent for flight records to be available for a sufficient number of pilots 60 years or older. In 1960 FAA established 60 as the age limit for pilots of large commercial aircraft out of concern for public safety. At that time, FAA stated that certain important physiological and psychological functions progressively deteriorated with age, that significant medical defects attributed to the aging process occurred at an increasing rate as an individual grew older, and that sudden incapacity due to such medical defects became more frequent in any group reaching age 60. The benefits of experience in the cockpit may, however, offset the potential for health issues related to age. 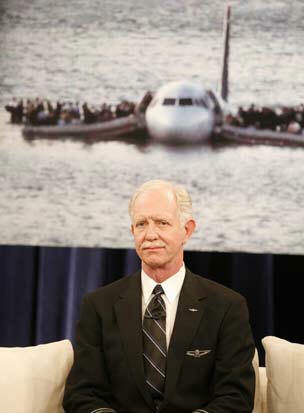 The value of such experience was recently demonstrated when a 57-year-old pilot safely landed his U.S. Airways jetliner in New York’s Hudson River on January 15, 2009, after the aircraft was crippled by bird strikes while taking off from LaGuardia International Airport. In November 2006, the International Civil Aviation Organization, the United Nations aviation organization that develops standards for international aviation activities, increased the age limit for certain pilots—i.e., those pilots engaged in operations with more than one pilot—to 65 years, provided the other pilot in the cockpit is under age 60. FAA has established a number of rules regarding pilots of large commercial aircraft to help ensure safety. For example, pilots-in-command, also referred to as captains, must have medical checkups—including an electrocardiogram—every 6 months and first officers must have them annually.9 Depending on the crew configuration of the aircraft, FAA regulations restrict the amount of time pilots can spend in flight or crew duty status during a 24-hour consecutive period as well as the number of hours they are allowed to fly in 12 calendar months.10 Generally, pilots are allowed only 8 hours of flight deck duty during any 24-hour period. These rules help reduce the affects of pilot fatigue on safety. FAA rules also require both the captain and the first officer11 to be in their seats during critical phases of the flight, including takeoffs and landings. This rule helps ensure that even in the event of a sudden death at such a juncture, the surviving pilot would be able to keep the plane flying safely. 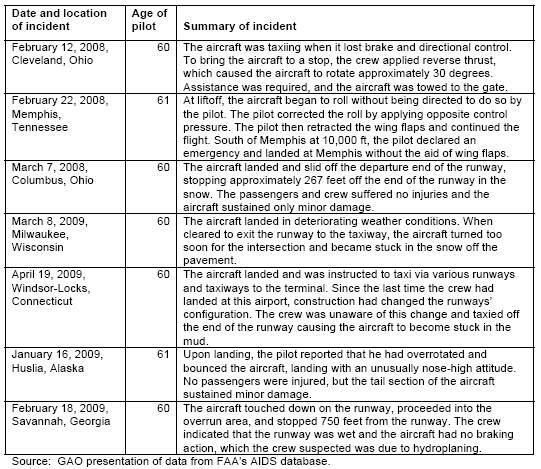 Table 1 summarizes information about these seven incidents. The data from FAA’s and NTSB’s databases during that period showed a total of 460 events, consisting of 54 accidents and 406 incidents, for pilots of large commercial aircraft who were younger than 60.12 NTSB’s Accident Database included no health-related events—accidents— involving pilots 60 years or older that occurred during GAO review period. Although FAA’s AIDS database did not include any accident or incident involving the health of a pilot aged 60 or older, FAA officials told us that on June 18, 2009, a 60- year-old pilot of a Boeing 777 aircraft who was serving as captain died en route from Brussels, Belgium, to Newark, New Jersey. The first officer landed the aircraft in Newark without incident. According to FAA’s Deputy Federal Air Surgeon, an autopsy of the deceased pilot found evidence of moderate coronary artery disease, as well as old and recent heart attacks. However, this official said that there was nothing that aeromedical screening could have reasonably done to prevent this event, as the airman had an unremarkable physical on March 11, 2009. The pilot did have a history of high blood pressure and elevated cholesterol, but both conditions were well controlled with medication. The Deputy Federal Air Surgeon also said that the electrocardiogram at the time of the pilot’s last physical was unremarkable. According to FAA, this June 18, 2009, death of the pilot while airborne was the sixth such incident reported since 1994 for a commercial passenger airline pilot. According to FAA records, five pilots died while in control of a commercial passenger aircraft from 1994 through December 2007. During that entire period, the retirement age was 60, and the pilots ranged in age from 48 to 57. According to FAA, none of these in-flight pilot deaths resulted in an accident. Furthermore, these deaths need to be considered in the context of the millions of flights that take place every year. In that context, the six deaths that have been reported for the almost 155 million departures since 1994 translate into about 1 chance per 26 million departures that a pilot will die in flight. Less than 2 years have passed since the act’s enactment, and therefore the record is limited. FAA’s existing medical certification requirements and regulations requiring redundancy in staffing aircraft have continued to help ensure flight safety even when a pilot has died in flight. According to the Executive Director of the Aerospace Medical Association, to definitively determine whether advancing age—in this case, reaching age 60 or older—presents an added risk to flight safety because of cognitive or neurophysiological changes or sudden incapacitation due to a medical condition, one would need data for a large enough cohort of commercial pilots under age 60 and a similar cohort of commercial pilots aged 60 or older to compare their respective flying records over a period of years. However, sufficient data are not yet available for such a comparison because of the recency of the act. GAO noted that other factors, such as flight conditions, would also have to be considered in such a comparison. Therefore, it is premature to conclude that the increase in the age limit for pilots to age 65 will or will not have an impact on a pilot’s performance and aviation safety. As stated in the act, carriers are required to monitor the performance of all pilots with a special emphasis on pilots who have attained 60 years of age.